Convertibles are an oddly attractive target of vandals and thieves. For whatever odd reason vandals like to cut convertible roofs more than say, put a brick through a passenger window or do some other senseless act of violence against convertibles. 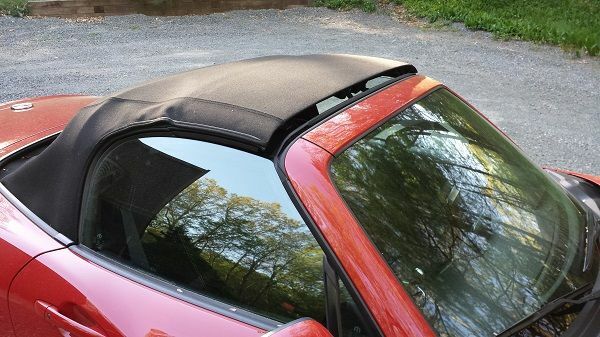 Theft is sometimes the motivation, but whether a Miata or Fiat Spider is unlocked manually from roof access or a broken side window the alarm still blares, so cutting the roof is no more silent than any other way in. Some owners add hardtops to their prior-generation Miatas, which can be relatively affordable. To avoid the roof being cut, owners sometimes leave the roof pulled mostly closed, but unsecured by the internal clasp that locks it shut. From the outside, the roof can be pulled or pushed back opening the cabin to the environment and for thieves, to the interior. The upside is no cut roof should this happen. - Video - Watch a convertible roof save a woman's life here. There are two other reasons owners leave a roof this way in a Miata or Fiat Spider. The second is that it allows the cabin to stay cooler on hot days, but will still keep leaves and bird droppings etc, from entering the cabin. Last, the roof is easy to pull back when the owner returns from outside the car, rather than unlock it from inside, push it back over the shoulder and then reach back awkwardly to give it the last push it needs to click into place. Obviously, this is a dry weather trick and best used by owners who are in a store shopping or have left their car for a short period of time. Valuable items can still be secured in a Miata in either the locking compartment or in the secret compartment hidden in the cabin. If you see the cars this way, now you know why they are left that way. If you own a Miata or Spider tells us below if you use the trick yourself sometimes.